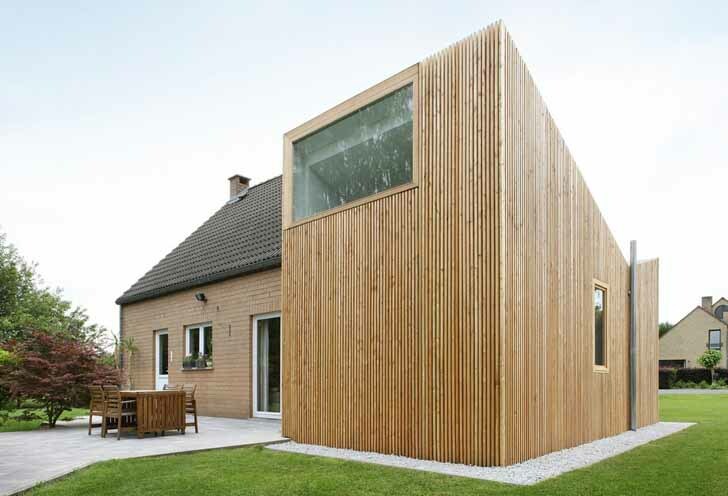 House AND is a gorgeous extension to an existing home in Anderlues, Belgium. Brussels-based architecture studio adn Architectures wrapped the extension with a slatted wooden facade that playfully clashes with the original structure's masonry walls. The extension's inverted roof draws the eye to the new part of the residence, which was designed it as an alternative to the many pavilion-type homes found throughout Belgium. 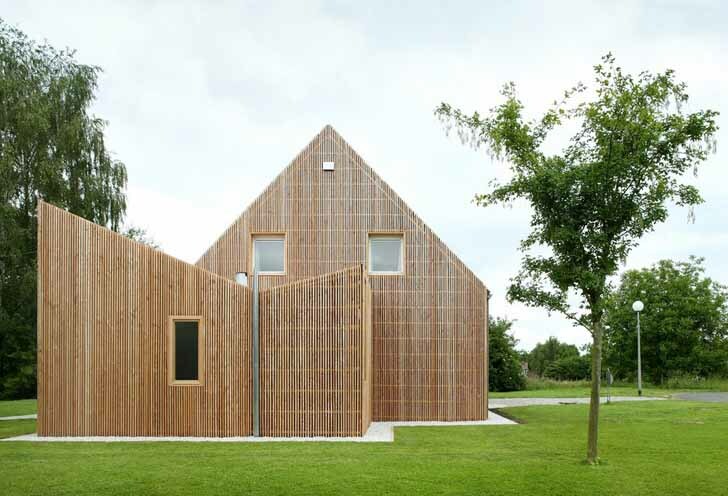 Belgium’s residential architecture has been dominated by widely-produced pavilion-type houses, which are affordable and can be quickly built. The industrialization of housing enabled many people to achieve the ideal of a house with a garage and a garden, however these homes are often compromised by poor quality in terms of space and integration within the urban landscape. adn Architectures‘s House AND draws inspiration from the existing building and references its traditional pitched roof – however it playfully inverts the apex. The new 24 square meter addition’s wooden façade also clashes with the masonry of the house. The interiors are simple and serene, and windows frame carefully chosen views of the surrounding landscape. The Belgian residential architecture has been dominated by widely-produced standardized pavilion-type houses which are affordable and quickly built. This ideal of a house with a garage and a garden has been realized with the industrialization of housing. This is often compromised by poor quality in terms of space and integration to the urban landscape. The addition draws inspiration on the existing building and references its traditional pitched roof, but does so through inversion. The roof of the new 24-sqUare-meter addition is inverted, while its wooden façade clashed with the masonry of the house. Windows frame specific views of the surrounding while the interiors create a serene atmosphere.